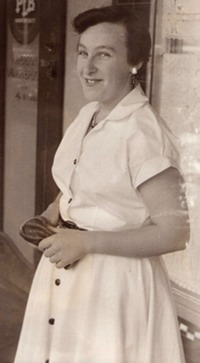 DAWN MARGARET QUALTROUGH, 04/04/1935 at Murrayville, was the daughter of HORACE EDWARD QUALTROUGH and of LILLIAN HARRISON of Bendigo. 1. ADRIANO (Married Gayle Hammond 1981; Divorced with no children); Married Karen Mack (Children of Adriano: Joshua; Chelsea; Mathinson; Marco). 2. MARCO married Jane Feltham, Divorced with no children. Our family was living at Linga, when I was born, When, my birth was imminent My father had to take Mum to the Hospital at Murrayville on a Railway Trolley. My earliest memory of living there was when I was about 3 years old. I received a little Tin Stove and Cooking Utensils for Christmas and when Mum came home from her duties at the Railway Station, she would light a fire in it and we would cook Potatoes etc. Unfortunately, one afternoon my brother (Brian) jumped, down from the fence and accidentally broke my stove. My Sister Betty was born in 1936, so, she would be about 2 years old when the next accident happened. The next incident I remember about living up there was the very hot weather (sometimes 400 F). Mum had put our Bathers on before she left for work, we knew that there was a bucket of water left for us to play in, but unfortunately my brother found a tin of Kerosene and tipped it into the bath to play in, of course the three of us got burnt with the Kerosene, but I do not remember what Mum put on us to stop it burning. The next transfer Dad received was to Koyuga where I started School in 1941. There was only one other boy in the grade 1. We left this school at the end of 1942. Mum had an argument with the Head Teacher about Brian going out to learn Gardening instead of being educated. The three of us left this school at the end of 1942 and were transferred to St Mary’s Primary School, Echuca. I made my First Communion here on 13th August 1944. In 1945 Dad was transferred to Nandaly, as a Ganger, (in charge of other men). Dad drove his Model T Ford Car up to Nandaly, we spent the night at a Hotel. I think we took 2 days to get up there but I do not remember where we stayed overnight. The owners of the Hotel took us to visit the house where we were going to live, it was just getting dark and the girls told my sister and I that the house was haunted. I was very frightened but Mum said they were only tricking us. The next day all our Furniture arrived by Train. There was a Water Tank in the back yard and the Railway Department would send a Water Tanker by rail to fill it up when we needed water.. When the 2nd World War ended in 1945, the School Master gave us a Holiday, we went home and told Mum but she would not believe us, so she turned the Radio on. The three of us attended the Nandaly State School, this school only went up to Grade 6. I was 10 years old at the time. I repeated Grade 5 twice. When Brian finished Grade 6 there was no other school for him to go to school only at Sea Lake, there was no Buses running there, so Mum and Dad sent him down to Bendigo to board with our Auntie and he went to the Marist Brothers College. One day Betty and I was coming home by the Bus and the Bus had an accident, there was another Road that came from Melbourne and it joined the road we were travelling on at Harcourt. The Bus driver did not see the Truck coming off the other road until the last minute, so, instead of having a very serious accident he crashed into a Bridge, if, Brian had been on the Bus he would have been killed because he used to stand in the doorway. The people from the Cafe came and helped all the people of the Bus through the Emergency Exit and that was the first time I tasted Brandy. Another Bus was sent down to Harcourt to continue to Bendigo. I was 15 when this happened. In 1950 Dad got a transfer to Bendigo, we lived at The Corner of Holmes and Holdsworth Roads, Eaglehawk. I went to school at St Mary’s Secondary College, Betty attended St Liborious’s at Eaglehawk. I completed year 9 at St Mary’s and received my Proficiency Certificate, and continued on my schooling at the Business College in Bendigo (where I met Margaret Qualtrough). I left here in 1951 after receiving very good passes, in Book-keeping, Shorthand and Typing. I worked for the following firms before my Marriage :- 1. Myers. 2. Sandhurst Trustees. 3. C. Maskell (Motor Body Repairs). 4. Buckell & Jeffery. I left here to get Married and moved down to Melbourne, here, I worked for, McCarron Bird Pty Ltd, for 4 months, leaving because I was expecting a baby. I will skip the next 30 years, that, was taken up looking after children, working part time for 16 years at the Ford Motor Co, in the Canteen. In 1979-80 Vittorio, Mark, Marisa and I went to Italy to see his relations, we were there for 6 weeks of the School Holidays. His brother and family came from Argentina to see us. On Christmas Day of 1979 there were 31 family members at the Party. That was the last time my husband saw his family. When I retired in 1986, I looked after Dad, Mum, Auntie Eva, and my Husband who all died within two years of each other. Three years after my husband died I decided to go overseas and visit his cousins. I travelled for 5 months, staying at following countries, America, Canada, Argentina, Wales, Italy. Another three years after that I went to Perugia University, (to study Italian), this time I was away for 1 month. After, finishing at the University my friend and I did a Tour of France and England for a week each, then I stopped at Italy on the way home to see my Sister-in-law. During the past years I joined St. Vincent de Paul Society, was a member for 20 years :- Conference President twice,(3 years each term), Regional President, once (3 years). I semi retired from the Society last year. I have been a member of U.3.A. (University of the 3rd age), since 2002. The subjects that I am studying are (2 classes Computers), 1 Craft. I also do my own Gardening, etc and look after Grandchildren as well as visit sick and lonely people. © 2018 by Malcolm Qualtrough, Elizabeth Feisst and the late John Karran Qualtrough. Hosted by Ask Web Design, Isle of Man.